My Story. Here I go again—off on another road trip, this time in early July, 2017, to the Mohawk River Valley in upstate New York. 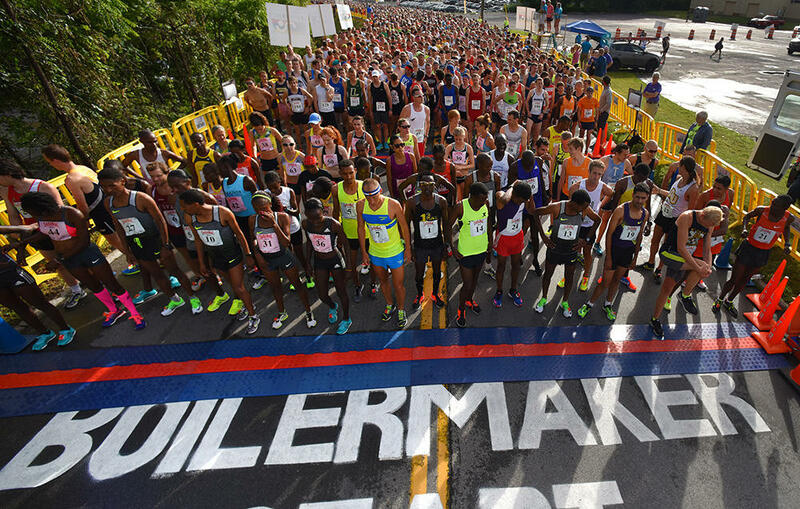 They have a wonderful little 15K road race there in Utica called the Boilermaker. The ‘little’ is an understatement. They cap the race at 14,500; that is the only sense in which it is ‘little.’ It attracts runners from the local community, the surrounding area, nationally, and internationally. 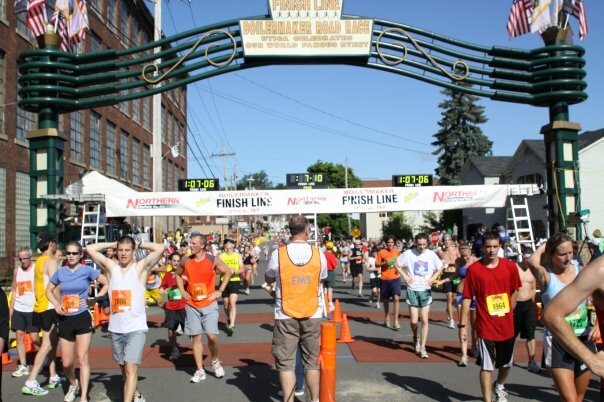 The Boilermaker is one of the most prominent, iconic road races in the US. It has been around since 1978 when a fellow who builds boilers in Utica got together with Utica’s F.X. Matt Brewing Company that brews Saranac beer. So between an actual maker of boilers and the maker of a beer that could be used in fashioning the drink called a ‘boilermaker’, a beer with a shot of whiskey, the race got its name. They wanted to sponsor an event that would promote fitness in their community. And have they ever been successful, and how! One of the things that has ensured its popularity and its continuation is the huge party at the end of the race right next to the brewery. If you like race parties, you would love the Boilermaker! Why the Boilermaker 15K? For me it was a ‘bucket list’ race. Still on the comeback trail, I keep hoping for a breakout workout or race but so far just slow, steady progress after a left hamstring injury in May 2016 and a minor re-strain in October. I had run a 1:11:35, or 71:35 if you will, in early February at the Double Bridge (15K) run in Pensacola Florida and I hoped to run a good bit faster with another 5 months of training under my trainers. My stated goal was ‘sub-71 at 71’, a sub-71 minute race at 71 years of age. 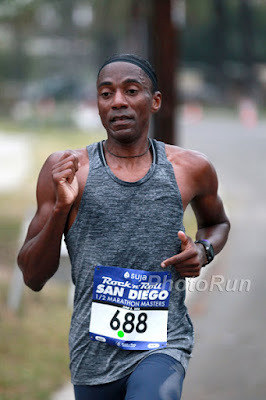 I finished 2nd in the National 10K Championship for Men 70+ in 44:57 in April but then won the National Half Marathon Championship on a rainy May day in Southern California in 1:41:42. The 10K time equates, through the age-grading tables, to a sub-1:09 but the HM to a 1:11:22. And, from what I had heard, the Boilermaker course would be tougher than either of those. Sub-71 was a worthy goal but of course I hoped for something more like the sub-1:09. Getting there was uneventful; I took two days, with a longish first day, Friday, so as not to have a long drive on Saturday, the day before the race. One neat thing was that my motel in Rochester NY was only a couple of miles from a park called the Greece Canal Park. The key element of that name is not the word, ‘Greece’, which in this case is just the name of a Rochester suburb, but the 2nd word, ‘Canal.’ Anyone who grew up as I did, learned the song in elementary school that starts, “I got a mule, her name is Sal, 15 miles on the Erie Canal….” Might this Canal Park be along the Erie Canal? Indeed it was! I do a lot of my training runs along a canal towpath in Indianapolis so this was a real treat! The towpath was quite similar, but the waterway itself was much bigger and navigable! I had only been running on the path a few seconds before a big cabin cruiser came churning by. Some fun! I arrived in Utica in late morning on Saturday and drove the course. I knew the course was point-to-point with little elevation change from start to finish. But I also knew there were hills in between; about 300 feet of elevation climb in the first 4 miles. Three hundred feet of climb is not necessarily a lot if spread out over 4 miles, but the rises are more concentrated than that. The course begins on a gentle up slope but then after a bit gets into the first set of rolling hills. Later there is a steep climb of moderate length followed by a slightly less steep climb that is much longer. Those would be the challenges in the first 4 miles. There would be a half mile downhill stretch after mile 4 and then another long downhill stretch before mile 8; in terms of getting a good time, those would be at least as critical as the uphills. I planned to go out moderately, endure the ups, run relaxed while attacking the downhills, and try to maintain pace on the flats. That is easy enough to say, but could I do it? Next up was packet pickup! I parked at the Mohawk Valley Community College and followed the crowds to the ‘Old Gym’ and found my place to get a packet for last names from ‘Cad…’ to ‘Cas…’. To my surprise, the young fellow handing out the numbers appeared to be about 10 or 11 at most. It is ‘all hands in’ for a true community effort in Utica. He showed me that my name was not on his list. I could see that he was right and was about to get out my cell phone and call the Elite Coordinator when the lad said, “Wait a minute; I’ll get the Master List. He came back with a very large binder, assuring me: “This contains everyone even the Elites, and don’t ask me what that means just that they’re really fast runners.” I could see him sizing up my bald dome and white-flecked beard, thinking it highly unlikely that I would fit in that category! After flipping through a few pages his expression changed to one of wonder and awe as he exclaimed, “Oh my gosh, you are one of the most elite of all possible-wow! You got a light blue number—amazing! But where is your bib?” As it turned out there was a light blue number in the middle of the stack. “There you go—bib and pins! Get your complimentary Boilermaker pint glass and some other giveaways.” That evening I affixed the bib with the pins and laid out my gear--all set for the morning. I had heard stories about how the Boilermaker race had sometimes been run in 80 degree temperatures with high humidity but the forecast had been promising-blue skies and low 60’s at the start. And in one of those rare but well appreciated cases, a good forecast held true! I arrived early and parked about a half mile from the starting area. I did a first set of jogging, stretching and strides before handing in my gear check bag. Despite mingling with the multitudes, once I got to the starting area proper, I was told my light blue number allowed me to walk up through the different colored corrals all the way to the front. Once there I went through the rest of my warm-up routine and looked about to see if I knew anyone. I eventually spotted ace Masters Runner, Kevin Castille, warming up. Since regaining his form about a year ago after some difficult injuries, he has been tearing up the roads again. He ran a 1:03:58 at the Garry Bjorklund Half Marathon (at Grandma’s Marathon weekend). We exchanged greetings and wishes for a good race. I spotted two runners I knew from USATF National Masters Championships, Jake Stookey, the barefoot runner for the Clifton Road Runners, and Tim Van Orden of the Central Mass Striders. I had heard that Bill Rodgers would be a celebrity guest runner and thought I might see him, but no luck. I greeted Derek Jones, one of Castille’s Masters protégés and congratulated him on his sterling effort at the 10K Masters Championship in Dedham MA where he threw in surge after surge trying to win the race. Then they called the Elites to the starting line and I saw a couple of dozen Ethiopian and Kenyan runners along with a few Americans, most notably Tim Ritchie for the men and one of the newest Masters celebrities, Jen Rhines, who is still competitive for the Open podium. It felt weird for me to be lined up right behind them and in front of runners like Stookey and Van Orden who would run much faster than this 71 year old, even if I am the 2017 National Half Marathon Champion. That would not help me much if I was going at 7 minute/mile pace and everyone right behind me wanted to go at 5 minute pace. I did not want to start too fast but I also did not want to get run over! Time to run big or go home! I had no trouble once the gun went off, settling into a good pace, although still not the breakthrough pace I continue to hope for. The first steep hill was a challenge but went okay, then a brief down slope and then across the 5K mat-they called out a 23:46. Despite the uphill nature of the first part, I was disappointed. I still had the longer hill before me; I needed to do better or I could kiss my sub-71 good-bye. Soon we were running along a paved road through a golf course but up a considerable hill. With two switchbacks before reaching the top, the slope was challenging but manageable. I can just imagine how much fun it would be, though, if it were 15 degrees warmer. Then I told myself “Carry the stride over the top and attack the downhill” just as my old college XC Coach, John Pistone, from 50 years ago, would have said. The downhill went by quickly and then we were back on the flat again. This would be one of the challenges—it would be very easy to fall into a steady pace between miles 5 and 6 that would be too relaxing—If that happened, I would be over 48 minutes at the 10K. No rest for the weary! Luckily for me when I crossed the 10K mat, they called out 47:18; some quick math put the 2nd5K at 23:32. I thought, ‘Speeding up, that’s good-Keep it up now!’ The last 5K had an initial section of ‘rolling flats’ [flatter than rolling hills but not ‘flat and fast’] followed by a long, gradual downhill, and then another last mile of rolling flats with a 9 meter gain in the first half mile and a 10 meter drop over the last half. That last mile is tough as everyone is trying to gain time on everyone else so we all run a little faster than we otherwise would, but lack the satisfaction of overtaking. Then it was done, under the timing clock, across the mat, and through the chute! Gun time was 1:10:39 for a final 5K of 23:21, my fastest of three and reaching my ‘Sub-71 at 71’! Got my goal! Put it in the books! Then it was a leisurely stroll through the long chute to the celebration. After the famous Boilermaker Finisher pin (pictured) there were water bottles, fruit cups, chewy granola bars and then at the festival site, chocolate milk, bananas, Chobani Greek yogurt, and free Saranac beer. They did limit each individual to no more than three cups at a time, but that gives you the idea—there was no stinting! Lots of smiling people, rock band up on the big stage-it was the perfect ending to a great experience. Later I found that I won the Age Division by nearly 3 minutes. That's my story. How did other Masters Runners do? Kevin Castille and Derek Jones had good days, coming in 1-2. Castille, aged 45 now, ran a majestic 46:11! The current listing for Men’s 45-49 US record is 48:00 by Bill Rodgers set on this same course 22 years earlier when he was 47. Castille turned in the only ‘World Class’ performance of the day with an age grade over 95%. Jones was 2nd Masters overall in 51:00, 24 seconds ahead of the unshod Jake Stookey. Tim Van Orden, at 49, the oldest in the top 5 Masters, took 4th in 53:38. 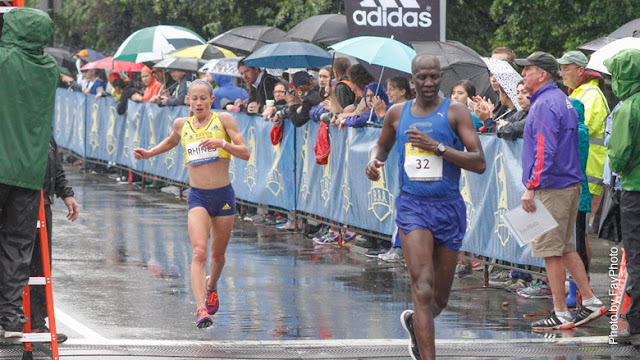 Ukrainian runner, Valentyna Poltavska, finished 2nd in 56:27, with Elizabeth Reed Perry 3rd in 58:10. Mary Zengo, 52, cracked the top 5 Masters and cracked an hour, clocking 59:45. She was the only other Masters runner to come close to a World Class performance, age-grading at 89.54! Not counting Stookey and Matthew Gokey, who both placed top 5 overall, the swiftest 40-44 year olds were two Canadians separated by only two seconds at the finish! Ottawa’s Terry Rushworth took the age group win over Toronto’s Darren Lee in 55:50. [All age division times are net.] Tina Greene took the same title on the women’s side by over half a minute but a mere 11 seconds separated Dara Dalmata, 2nd in 1:06:08, from Michelle Lavigne. In the Women’s 45 division there was a tight battle between Canadian Kuniko Soda and American Brenda Hodge, with Suniko taking the victory by a half minute in 1:01:13 as both turned in National Class times in age-grading over 80%. Peter Pazik also cracked the National Class barrier in winning the Men’s 50 division in 57:34, while Judy Andrew Piel and Charlotte Rizzo both achieved it in taking 1-2 in the same age division. Tim Dwyer came within two hundredths of a percentage point of 80% in winning Men’s 55 in 1:00:57 while Kelly Dworak, who finished 20 seconds ahead of Margaret McKeown in 1:09:06 in Women’s 55, both hit that age grade standard. Brian Cummins won Men’s 60 with a 1:03:50, to tip the age-grading scale at 80.0% exactly while Therese Christo’s 1:10:18 in winning Women’s 60 was closer to 90 than 80%. James Foster, 65, took Men’s 65 in 1:03:56, registering an 82.25% and the only other Master’s runner to match my goal of outrunning their age. The entire Women’s 65 podium cracked 80% age-grading as Martha Degrazia took the title in 1:20:07, followed by Marie Pittaresi , 1:20:59, and Paula Fitch, 1:21:25. Joanne Cunningham graded at 81.57 in winning Women’s 70 in 1:26:50 while my 1:10:37 to win the Men’s 70 graded just below at 79.21%. The oldest winner on the Women’s side was 79 year old Angele Carpenter who claimed the Women’s 75 victory and for the Men, 80 year old Sam Sammarco in Men’s 80. The oldest podium finisher was Sheldon Kall, 85, who took 3rd place in Men’s 80.